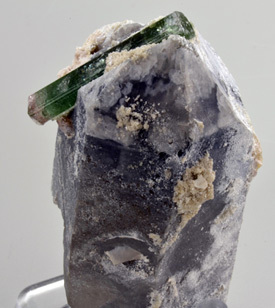 Description: Double terminated gemmy pale blue green tourmaline crystal (elbaite species) with a pale pink termination (lower left) on a smoky quartz crystal.There is minor damage to both terminations of the tourmaline crystal and the smoky quartz crystal but it is minor considering the fragile nature of this exceptional Maine tourmaline matrix specimen. 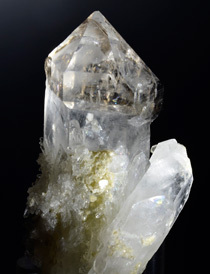 Size: The quartz crystal is 8 cm tall x 4.5 cm wide. 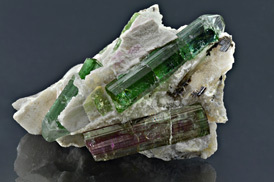 The tourmaline crystal is 4 cm long x 6 mm wide. Origin: Mined in the Durgin Prospect at Mt. Marie, Maine, found in the Go-Ahead Pocket on Nov. 28, 2011. Description: Twinned brownish gray hydroxyl herderite crystals, with minimal natural damage. These are the finest and largest hydroxyl herderite crystals known from Mt. Marie to date (May 2012). Size: The overall specimen measures 3.3 cm high x 1.7 cm x 0.7 cm, and weighs 12 grams. Origin: Mined in the Durgin Prospect at Mt. Marie, Maine, found in the Veteran’s Day Pockets, Nov 11, 2011. Description: Light smoky quartz crystal on a white quartz crystal. The termination faces of the latter crystal are visible through the light smoky crystal. Minimal natural damage to the main crystal stem and point. 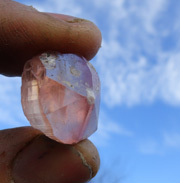 This is by far the finest and largest quartz scepter found to date (May 2012) at Mt. Marie. Size: The overall specimen measures 7 cm high. 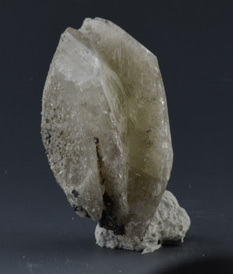 The light smoky quartz crystal is about 2.5 cm high x 2.5 cm wide. Origin: Mined in the Mt. Marie, Maine, Quarry, June 2010. 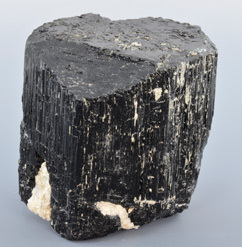 Description: Terminated pocket schorl crystal with minor albite. The termination is etched, resulting in a very unusual mosaic pattern. This piece has a fracture near the base on one side but overall is in good condition. This is by far the largest and finest pocket schorl crystal known from Mt. Marie. Size: This schorl is 5.3 cm high x 5.0 cm wide, and weighs 306 grams. Origin: Mined in Andrew’s Prospect at Mt. Marie, Maine, October 2010.